Print 1 was my most successful print. I had to use a gouge to carve the print into the print block. Then I used a brayer to cover it in ink and placed the covered print block on paper. I used a baren to smooth it out and removed the paper. That was how this print was made. This print was most successful because it came out better that all the other prints. Print 2 is the print that I enjoyed making the most because it was different from the others. You actually make the print using the bench hook and ink. The design that you want is what you create in the ink. 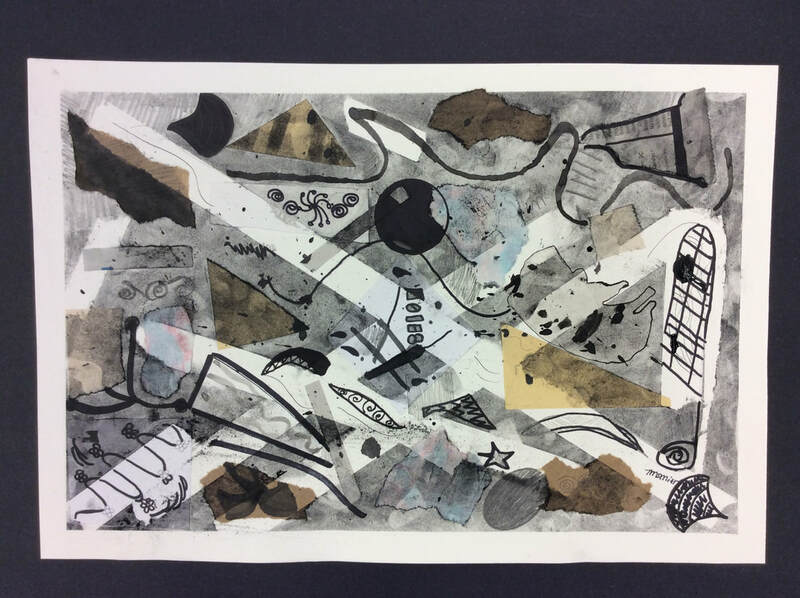 Next you put the paper on the print that you made. Remove the paper and there's your print. Print 3 is the print that I would do over if I had the chance. I carved a print into a piece of styrofoam with a pencil. Next I covered it with ink and pressed it onto paper to form the final piece. I didn't like it because it came out with the ink all together. It probably would have came out better if I didn't use so much ink. For this project we were allowed to pick what we wanted to make. We could also decide on our media that we wanted to use. I chose to make mugs out of clay. My inspiration was something that I could give as a Christmas gift but could also be a art piece. I learned a new technique which is using a cylinder ad the main shape of your mug to hold it together. A few problems I had were having really wet clay and not knowing which type of cylinder would fit the best. I communicated that I wasn't very good with clay through the dents and scratches. I asked my peers and my teacher for advice when I needed it but other than that I did everything on my own. I am very satisfied with the way this project turned out. We were challenged to make a sculpture out of styrofoam. That sounds easy except we had certain limitations. For example we couldn't use tape to hold our structure together only tacky glue which is very difficult to use because it doesn't hold very well. We also only could use two cups. As a artist I found that it was hard to come up with something to create but in the end I decided to make something simple and chose a duck. My piece is called “ The Ballerina”. 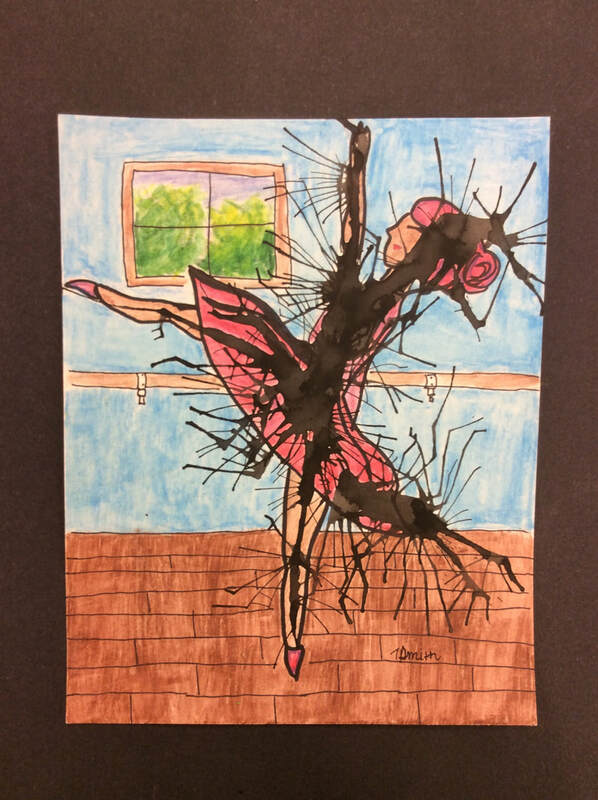 It took me awhile to figure out what I was going to do when I first saw my finished ink splat but the longer I looked at it I started to see a ballerina. After blowing the ink I outlined the picture in pencil. After that I went over the pencil with sharpie and finally I “painted” with water colored pencil.
" Phase 1 New Beginnings"
I hope that I’ll feel this same way about my projects yet to come. Heyllo my name is Tonasia. I can't draw to save my life but I enjoy art anyways. I hope you enjoy this blog and leave a comment with your suggestions. Thanks!